Manthakkali / Milagu Thakkali / Black night shade berry - these are different names given to the berry that goes by the botanical name of Solanum Nigrum. Both the leaves as well as the berries (dried / fresh) are used for their healing properties. my paati (grandmom) used to make a quick stir fry with the leaves and also add fried manthakkali vathal to be mixed with hot steamed rice and salt to cure any stomach related ailments, especially mouth ulcers and those caused by deficiency of vit C. My MIL made this Manthakkali Kozhambu for me after my marriage, and although I have never asked her for the exact recipe, I make it often as S likes it to have it for a pathyam (detox) diet. 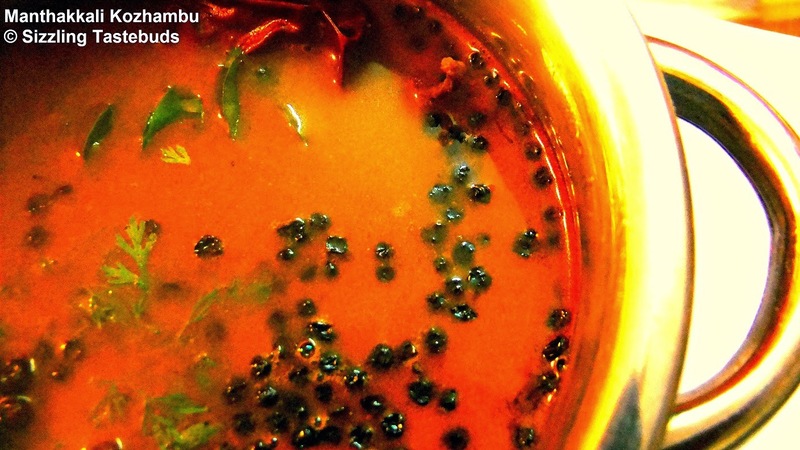 This kozhambu also serves as deworming medicine for young and old alike. Perfect for the winter and a great detox after a heavy meal. 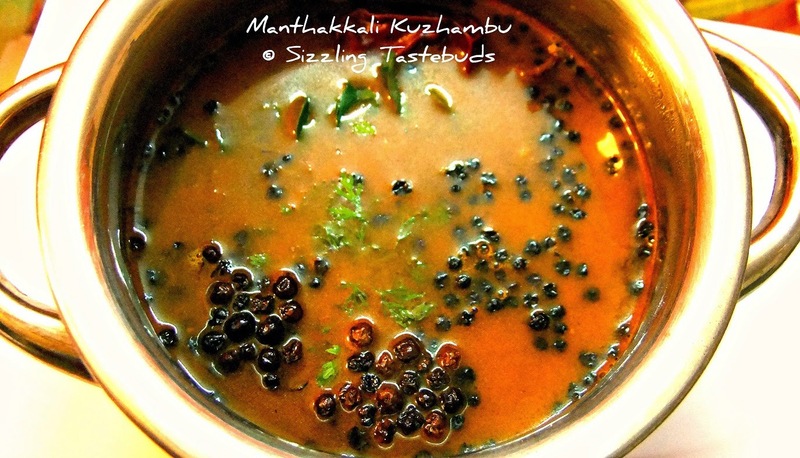 Sending this to Gayathri’s Walk through Memory Lane & Cooking Challenge – Tamilnadu by Vidhya. 1) Wipe the dried berries (vathal) with a soft white cloth. 2) In a pan, heat the oil and fry these berries till then turn crisp and transfer to a plate. 3) Meanwhile wash and soak the tamarind in 2 cups of hot water for 10 mins and extract the pulp. 4) In the same hot pan, add the sambhar powder, tempering ingredients and saute till the masala powder seeps into the oil. When the mustard stops spluttering, add the tamarind pulp, asafoetida, salt, requisite water (approx 3 cups) and bring to a rolling boil. Now add the fried Manthakkali berries and cook again. 5) If you want the kuzhambu thicker, mix 1 tsp of rice flour in 2 tsp of water and add to the boiling kuzhambu. Cook covered for further 3 - 5 mins and serve hot with steamed rice, a dollop ghee and sutta appalam (roasted Urad dal papad). superb delicious and yummy !! I love this one with curd rice. Yours looks so tempting. Looks Delicious :) and clicks look awesome..
never seen or heard of this berry... going to ask atmy local market for it. do u know the hindi name for it? @ Deeps, Mythreyi - this is called Black night shade in English or Makoy in Hindi.. you would get it at most South Indian stores. Ask for Vathal form of these berries.